It MUST be chock full of chocolatey flavor. Say no, never and not on my watch to that thin, liquidy crap from a mix that tastes like a bad weight loss shake. I want to feel like I’m drinking a melted Hershey bar, which brings me to the next important element: texture. A good hot chocolate to me is one that is slightly thick and more robust than say, coffee in its liquidity. I’m not saying it should have necessarily stew consistency, but it should be thick enough to leave a filmy residue on the back of the spoon after you stir it. If your hot cocoa is thin and broth-like…meh. It’s a no from me dawg. Thirdly: I want, no I NEED to have a crap load of elements on top. You can’t just stop at the hot chocolate itself. Why? Because a good Christmas tree is nothing without it’s trimmings. You gotta bedazzle that sucka, guys. I’m talking marshmallows, caramel, chocolate syrup, whipped cream, sprinkles, crushed peppermint candy, cookie crumbs. Show your taste buds that you mean business and give it the works. Or else, what is even the point? For today’s recipe, I can assure you: I did not hold back. I went hard. This hot chocolate really does have it all. It starts with a milk base that is melted down with semi-sweet chocolate. I recommend you use good chocolate here. Hersheys bars will work fine, as will Nestle semi-sweet chocolate chips or chunks but if you can use Ghiradelli, Godiva or Dove chocolate that I think would work even better. I even think that using dark chocolate or chocolate flavored with chili powder would be awesome, just to give it another level of flavor. So help me God, if you go and use some chalky generic store brand chocolate chips I will hunt you down, find you and shake you silly. You can of course make your own Dulce de Leche by either boiling or baking a single can of sweetened condensed milk, but if you can just get the pre-made Nestle one that comes in a can and is located in the Hispanic/Latino foods aisle of the grocery store,please just go with that. Less work. You can also use less of it in the cocoa if you prefer yours on the less sweet side. 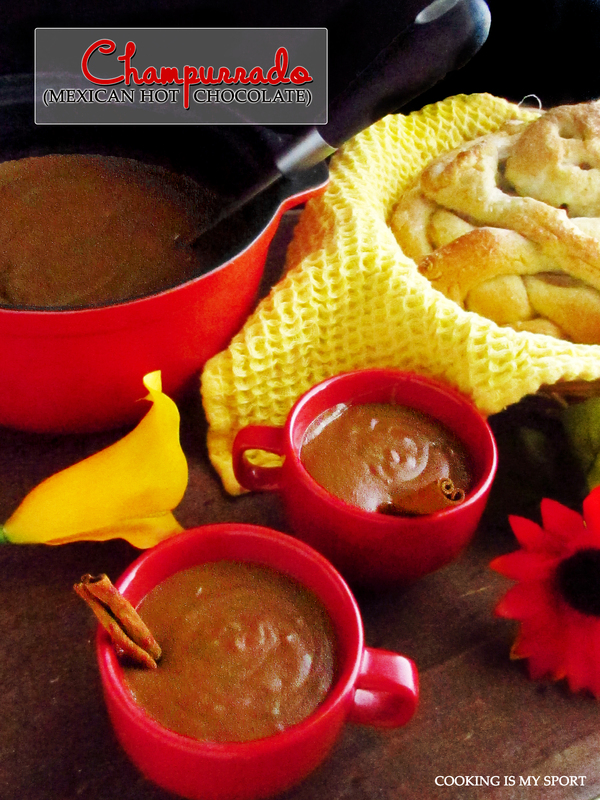 Now, make sure you’ve got all the garnishments on deck once the hot chocolate is made. It’s your customizable world here, but I used whipped cream, chocolate sauce, more melted dulce de leche that I had left over from the can and Christmas nonpareil sprinkles. Also (because I just don’t know how to quit) I dipped the rims of my mugs in hot chocolate, then pressed them into a dish of crushed gingersnap cookie crumbs, then let them chill in the freezer for about 40 minutes. That way, with every sip of hot chocolate, there’s also the added texture and flavor of the spicy gingersnap sliding down your throat. I realize this is extra, but what can I say? I be’s that way sometimes. Happy Fiesta Friday #149, (cohosted this week by Judi @ cookingwithauntjuju and Sandhya @ Indfused) where I’m linking this post. In a medium saucepan, bring the milk to a low simmer over medium low heat. Add the chocolate, dulce de leche and cinnamon. Cook and stir until the chocolate and caramel has melted into the milk and mixture is smooth, about 3-5 minutes. Pour into mugs and top with whipped cream, additional chocolate and caramel and sprinkles. I absolutely love the movie “Chocolat” starring Juliette Binoche and Johnny Depp. I’ll be honest, when I first watched it years ago, it was for one reason and one reason only: so I could moon over the physical perfection that is the The Johnny. (That’s what we call him in my house.) However, once we actually finished it, I was pleasantly surprised by how much I enjoyed the movie itself. It had some of my favorite actors in it (Alfred Molina, Judi Dench, Juliette Binoche), and the plot itself was very creative; a woman and her daughter travel from country to country opening chocolate shops and selling sweets with healing/magical powers to fix the lives of the people that buy them. It’s one of those cute, heartwarming, happy ending films to watch on sad rainy days, or on quiet Friday nights on your lonesome when you have nothing to do. Not that I’m speaking from my own experience or anything. I still watch Chocolat on a pretty regular basis, but nowadays, I find my attention caught by more than just the good plot and The Johnny’s smoldering gaze ( which God knows is enough of an incentive all on its own). I also love watching it for the food. But you guys knew that about me by now, I’m sure. Kudos have got to go the director of photography of this movie for filling it with so many gratuitous shots of rich, decadent chocolate. Word of warning: don’t sit down and watch this if you’re hungry and without any access to food. By the time it’s over you WILL be hangry (yes hangry: hungry AND angry. A lethal combination for me). Juliette Binoche’s character in the movie descends from the Ancient Aztecs, who believed that the cacao bean held magical powers. As such, they would grind it up and melt it down into a thick, rich drink that became hot chocolate. Aztec hot chocolate is shown throughout the movie to have a very strong effect on everyone who comes to the chocolate shop to try it. They take one sip and this mysterious music starts playing in the background- as if all their dreams were coming true from just drinking this stuff. Overly dramatic? Oh yeah. Justified? I wasn’t sure…until now. 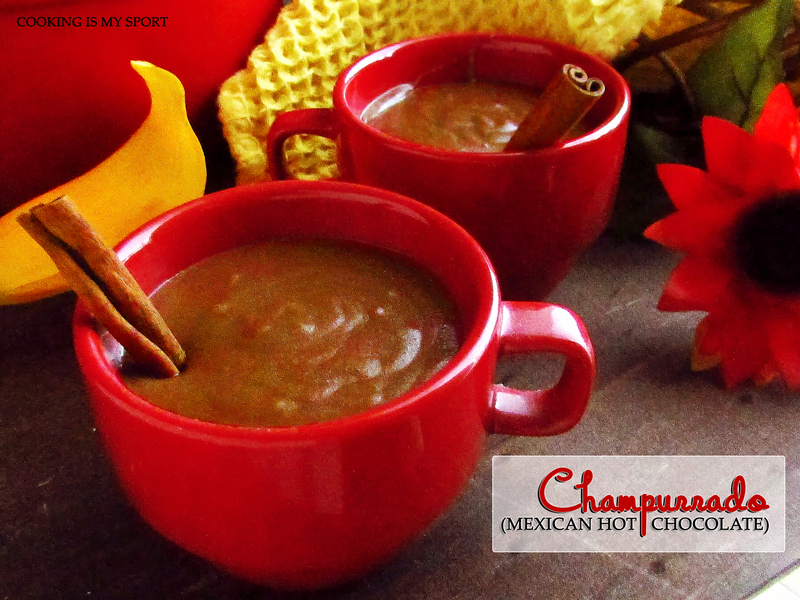 Don’t quote me on it, but I think that today’s Aztec Hot Chocolate has more or less trickled down into what we now know as Champurrado, or Mexican Hot Chocolate. I’d always wanted to try it, and recently all the stars came into alignment in my pantry (i.e., I finally had all the ingredients to make me quit procrastinating). Before I get into how Champurrado tastes, let me be clear about one thing: this is NOT what you would typically think of as ‘Americanized’ hot cocoa. For one, the masa harina makes this drink thick, almost to the point of a gravy consistency. Second, the masa gives it a slight corn-y aftertaste and although that may not sound appetizing, for some reason it just really works. Please, for the love of God, don’t try to use any substitutes for the Mexican chocolate. This recipe just doesn’t count at all if you do. You can’t beat that dark, rich flavor that the Mexican chocolate disks give to it. The one thing I would give you a free pass on would be the piloncillo because for a while, I didn’t even know what that stuff was.My mom ‘just happened’ to bring some home one day and since I didn’t know what the heck else to use it for, I decided to use it for my Champurrado. It’s a funny looking cone of solid sugar that you break down and crumble- I softened mine in the microwave for a few second increments.But brown sugar will also work fine. Once again, this is not American cocoa. Having said that, I have to let you all know that this Champurrado is the best hot chocolate I’ve ever had in my life. It’s rich, smooth and creamy; slightly bitter from the chocolate, immediately sweet from the sugar, and the masa harina finally providing a delicate balance between the two in the aftertaste. I’m never going back to my old, misguided Swiss Miss ways, you guys. I’ve seen the light now. ….Excuse me. I need a minute to myself now. 1. Add corn masa to large, heavy sauce pot. Using whisk, slowly add 4 cups water, whisking constantly until smooth and combined. Place saucepot over medium-high heat; bring corn masa mixture to a boil. 2. Add milk, sugar cane, chocolate and cinnamon to pot. 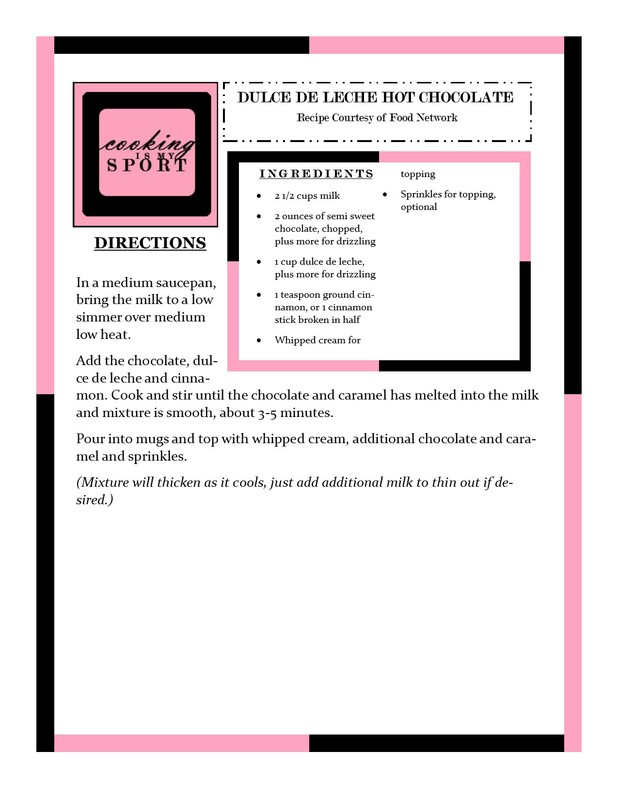 Bring milk mixture to boil, whisking constantly, until chocolate is melted and sugar cane is dissolved, 5-7 minutes more. 3. Remove pot from heat. 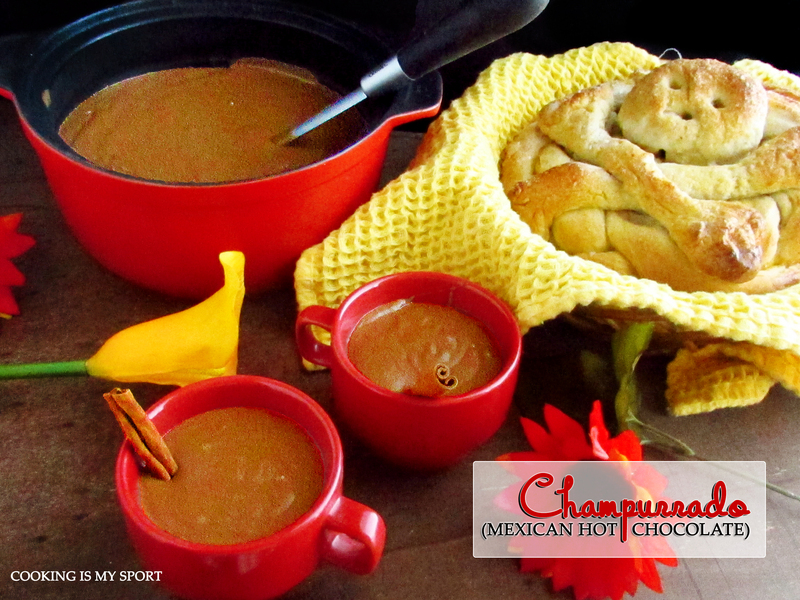 Divide champurrado evenly among serving mugs.